Born on June 20, 1965 in the town of Hissar, Tajik SSR. 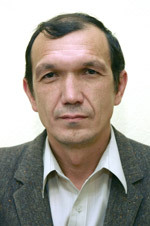 In 1991 graduated from the Leningrad State University, the Department of Asian and African Studies, the section of Arabic language and literature. From 2000 up to present - The Institute of Oriental Studies, the Academy of Sciences of the USSR, Leningrad (now St. Petersburg Institute of Oriental Manuscripts of the Russian Academy of Sciences), Junior Researcher. Major Research Interests: history, material culture and religion of the Ancient Eastern Mediterranean.